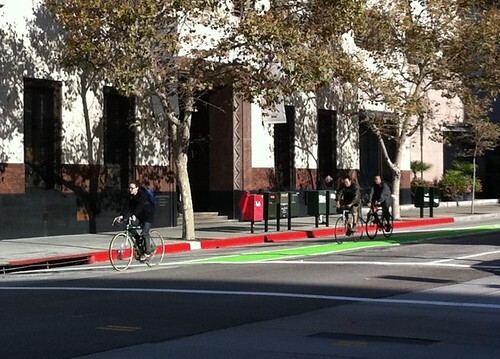 Spring Street has sprung a brand new, buffered green bike lane. This past weekend, city crews put the finishing touches on the new 1.5 mile Spring Street facility. Spring Street is one of L.A’s first green bike lanes and is the first designated Downtown bikeway from the city’s much heralded 2010 Bicycle Master Plan to be implemented. Running through the heart of Downtown Los Angeles, it connects a diverse array of eclectic Downtown neighborhoods including the Historic Core, Civic Center, Olvera Street and Chinatown. Inspired by September’s ThinkBike L.A. workshop, the Spring Street bike lane has successfully re-imagined a previously under-utilized Downtown street and re-purposed it into a multi-modal thoroughfare that now not only serves cars effectively, but bikes and transit too. This past weekend, First Street in Boyle Heights got the distinct honor of having L.A.’s first completed green bike lanes. Merging areas and bus zones along First Street were colorized using green thermoplastic. 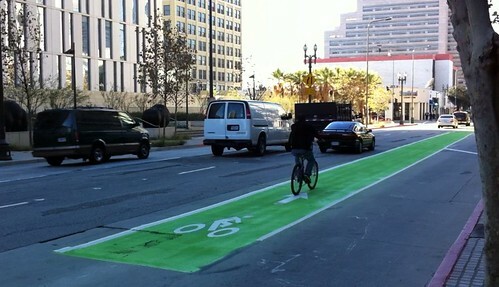 The green colorization was applied on select areas along the 1.6 mile long bike lanes that stretch between Boyle Avenue to Lorena Street. Colorization has been shown to be affective in other jurisdictions at increasing motorist’s yielding behavior, improving bicyclist visibility, and increasing perceived safety for bicyclists. More on the lanes below the fold. Here’s a sneak peak peek of what you can expect for Spring Street next week. Just a quick disclaimer: this is only an approximate visual representation and is not drawn to scale. You can see that Spring will have a buffered green bike lane, three vehicle travel lanes (the left most lane will have parking in off peak hours), and parking. For some photos of the preliminary markings, check out our earlier post here. Just a quick update on the Spring Street and First Street bike lanes. This past weekend, City crews put down preliminary markings and striping on First and Spring Street. You can find further coverage over at the L.A. Eco Village Blog here. Tonight, City crews are expected to begin installing new pavement markings for the new street configuration on Spring. Colorization is expected to occur this weekend with Spring going green from 9th to Cesar Chavez, while First St. will receive colorization exclusively at conflict zones. The Department has already ordered the colorization materials, and we are expecting for them to arrive later this week. Barring inclement weather, it is our intention to have striping and respective colorization complete by this coming weekend. Check out our flickr stream for some more photos of the preliminary markings on Spring St. in the Civic Center area (near City Hall and LAPD Headquarters). We’ll continue to update you on the blog as the project progresses. 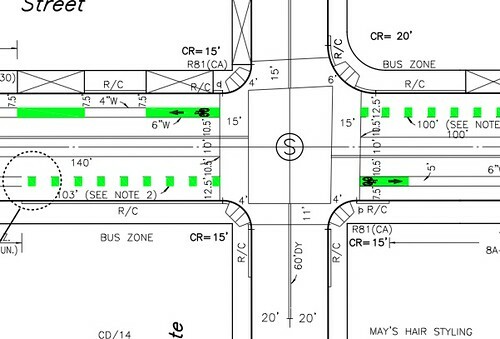 We’re back with another update on the 1st Street green bike lane project. 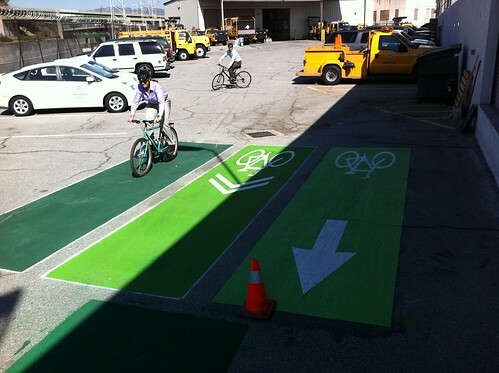 LADOT has been testing materials to ensure that the colorization will be durable, color retentive, skid resistant, cost effective, and highly visible. After considerable review, the Department has deemed colorization in conflict zones to be the most prudent treatment for the 1st Street green bike lanes. More on the project below the fold. 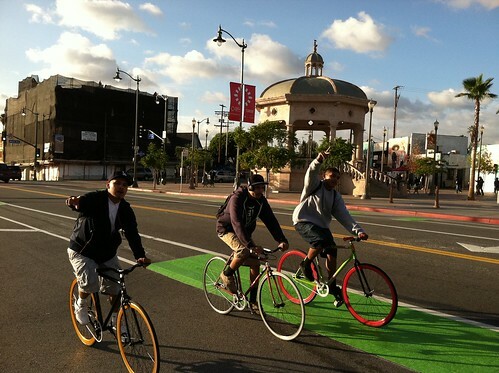 Back in September, we announced that green bike lanes would soon be coming to 1st Street in Boyle Heights. Today, we’d like to update you on some recent developments including a recent materials test that we conducted at a LADOT Maintenance Yard. For more pictures from the test (and some cool videos), check out our flickr stream here. 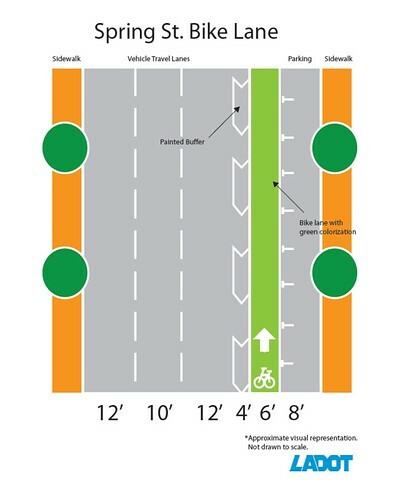 More on the green bike lane project below the fold. 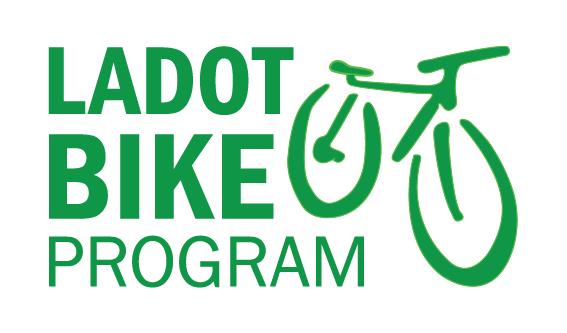 The Bike Blog is excited to announce that LADOT will soon be implementing a green bike lane pilot project, right here in the City of Los Angeles. 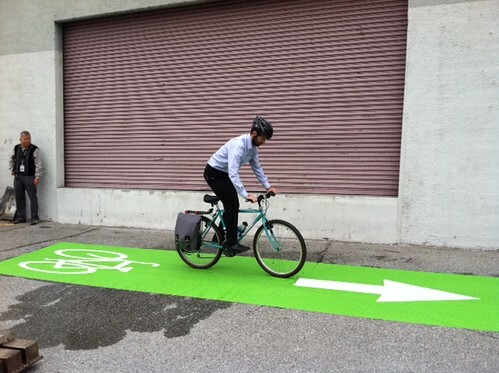 Jurisdictions around the country and around the world have been experimenting with colored pavement as a treatment that visually enhances the separation of bike lanes from vehicle travel lanes. Join us below the fold to find out what’s good about green bike lanes, the process behind getting them, and where you will soon be able to ride L.A.’s first example.